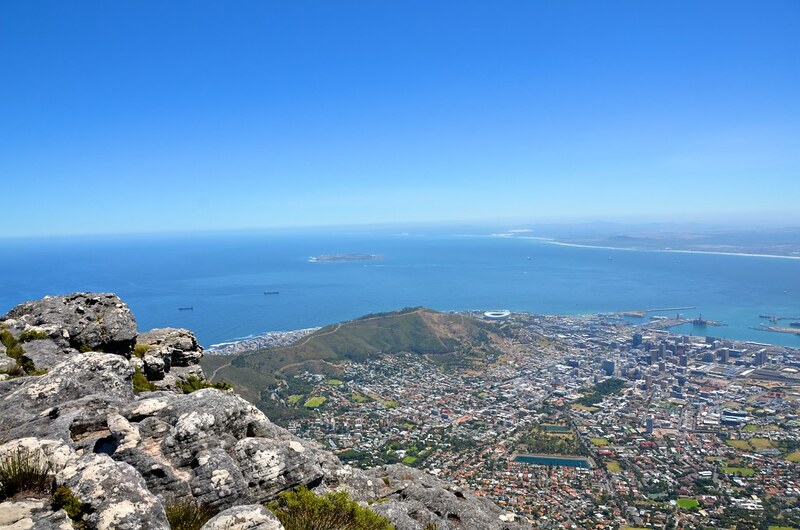 Table Mountain, or Tafelberg in Afrikaans, is a flat-topped mountain overlooking the city of Cape Town in South Africa. 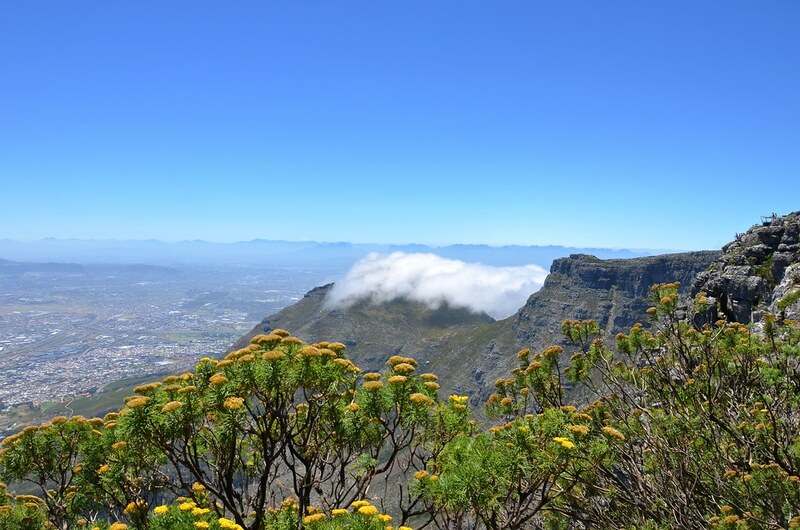 The level plateau is approximately 3 kilometres from side to side and it is believed that Table Mountain was formed under the sea about 600 million years ago. 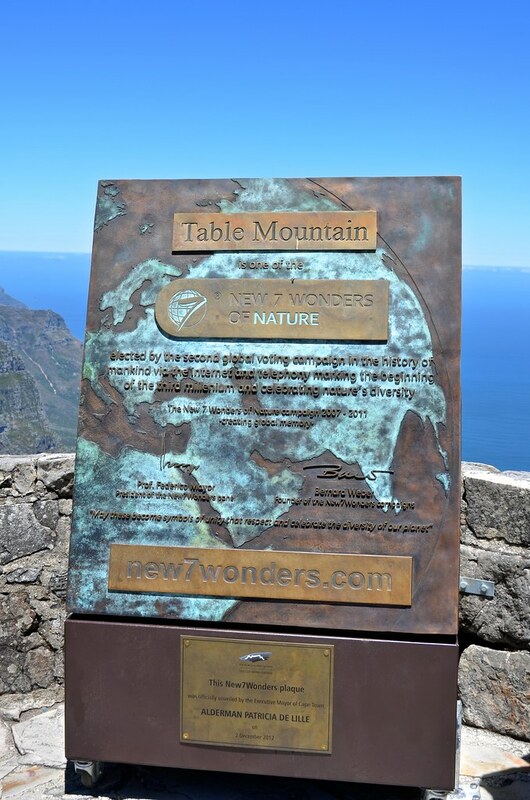 It is also one of the New 7 Wonders of Nature. 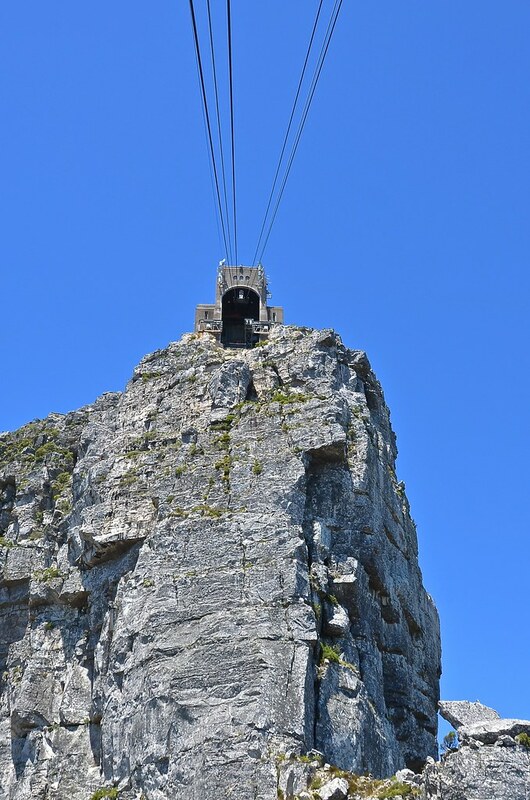 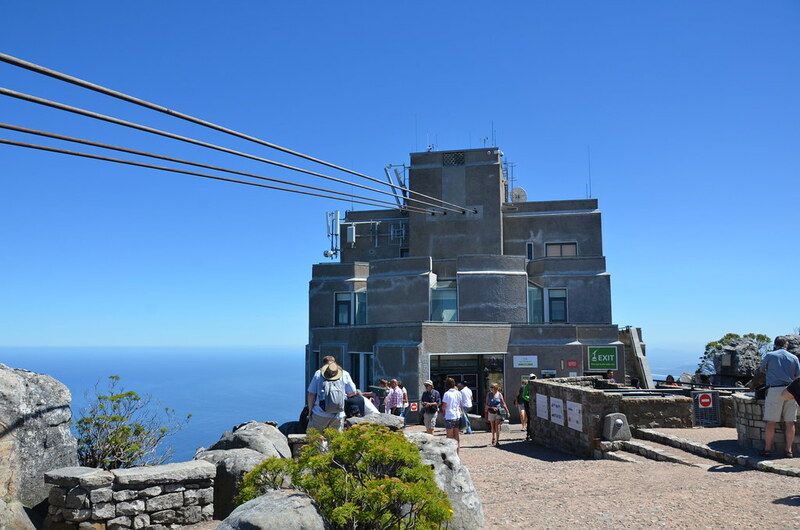 The easiest way to the top is on the Table Mountain Aerial Cableway. 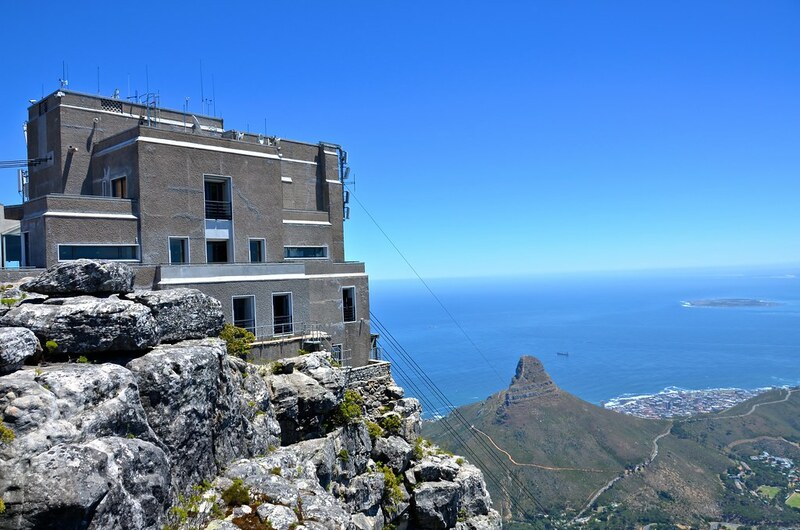 The Lower Cableway Station is on Tafelberg Road, off of Kloof Nek Road — about a 15 minute drive from the city centre. 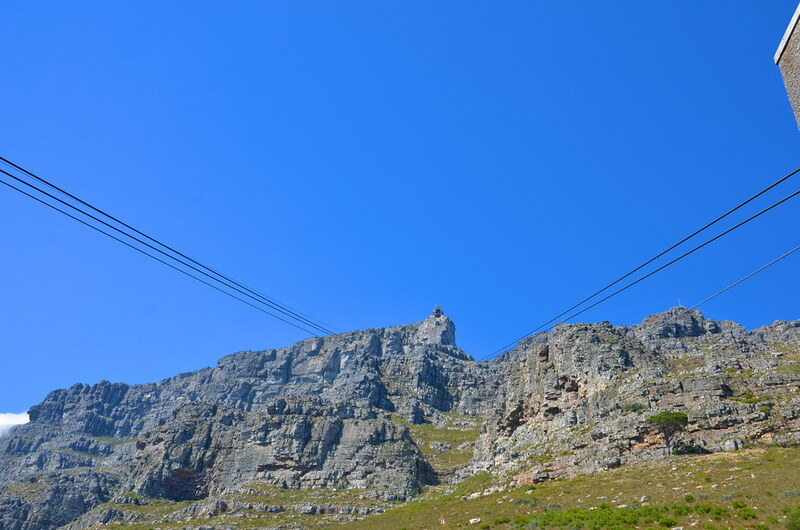 It is best to buy tickets online and skip the long lines. 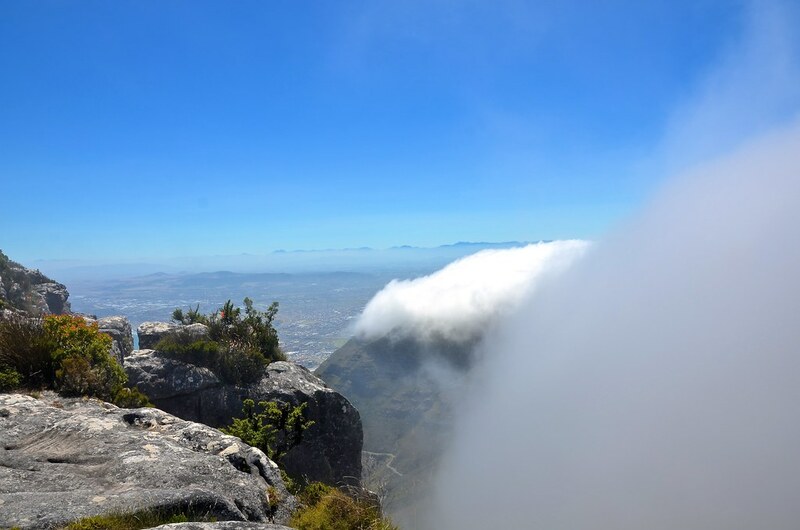 Tickets are valid for 14 days from the chosen date, so it is easy to watch the weather and decide on the best day to go to the top. 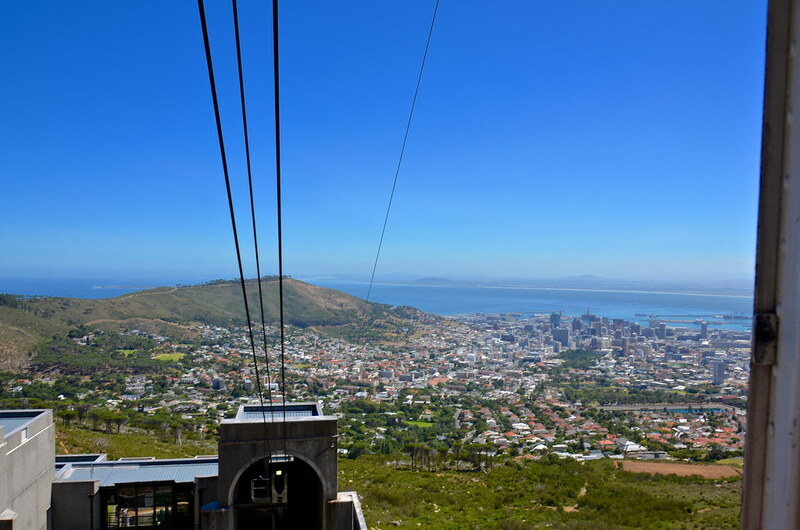 The floor of the cable car rotates offering 360 degree panoramic views of Table Mountain and Cape Town. 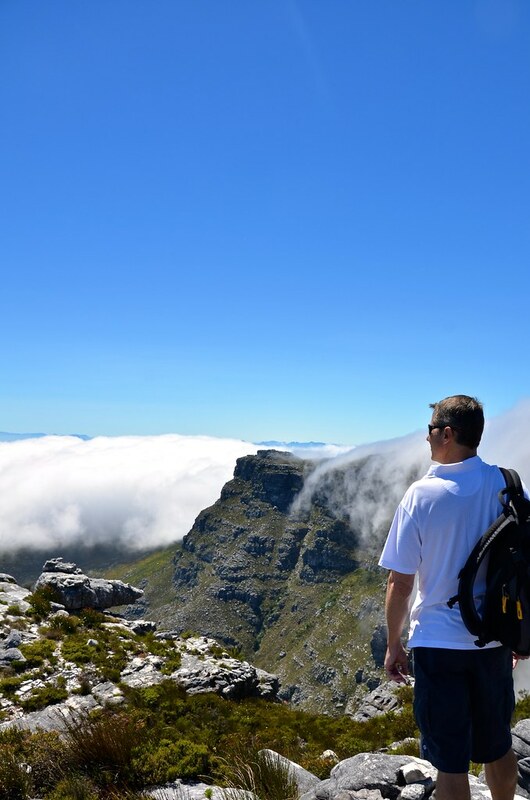 Once at the top, you are free to explore on your own or join one of the many guided walks. 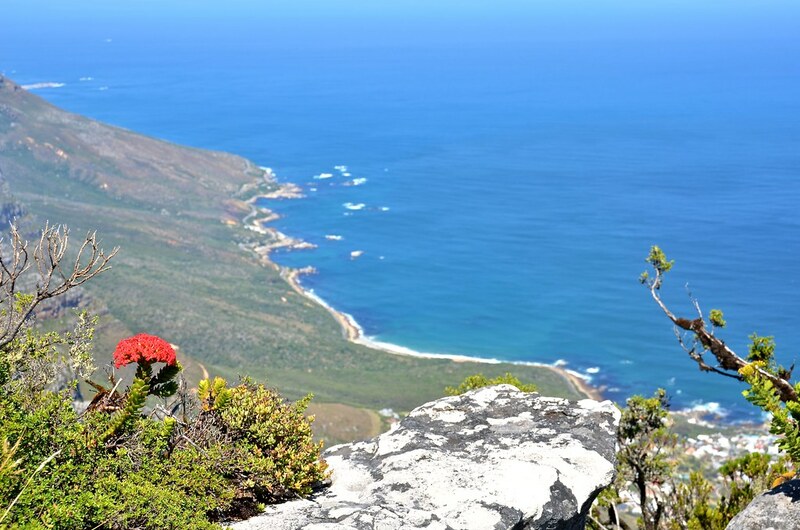 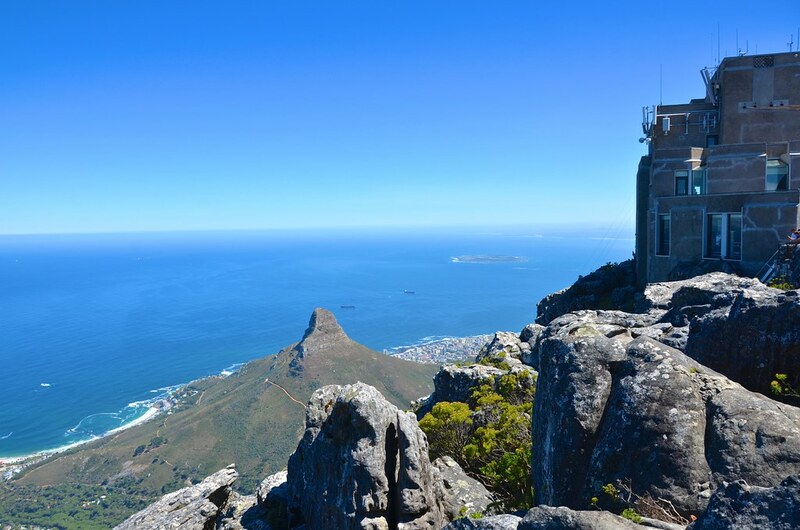 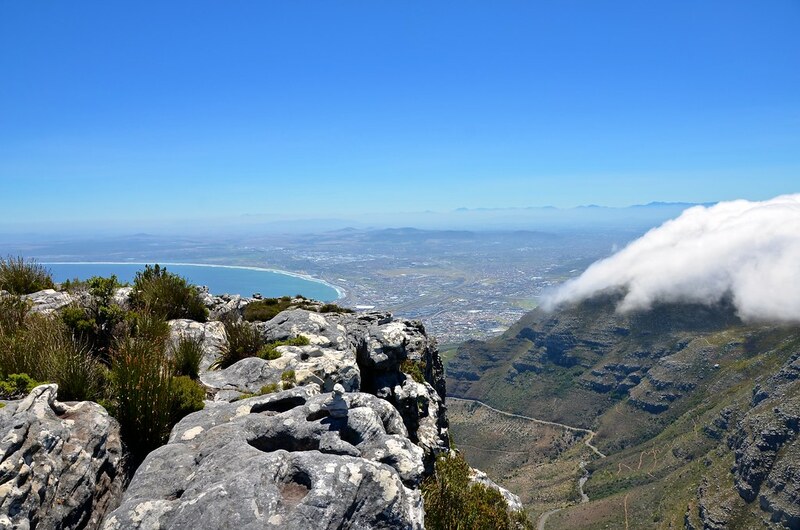 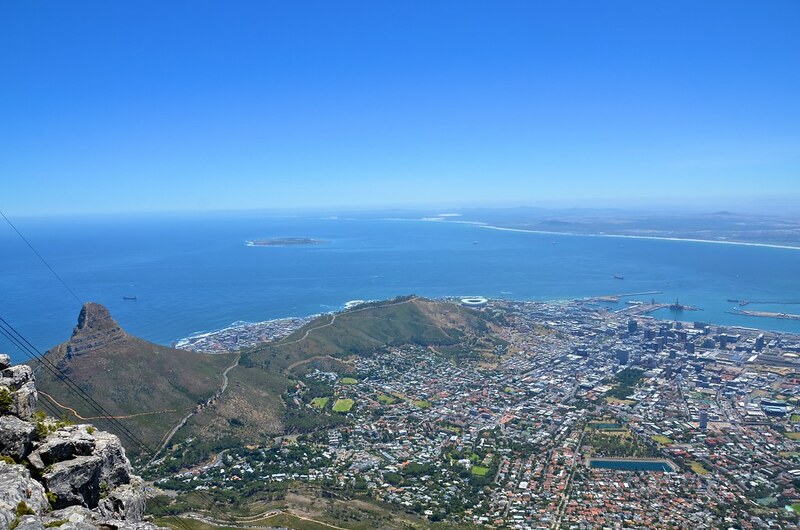 The view from the top of Table Mountain has been described as one of the most epic views in Africa. 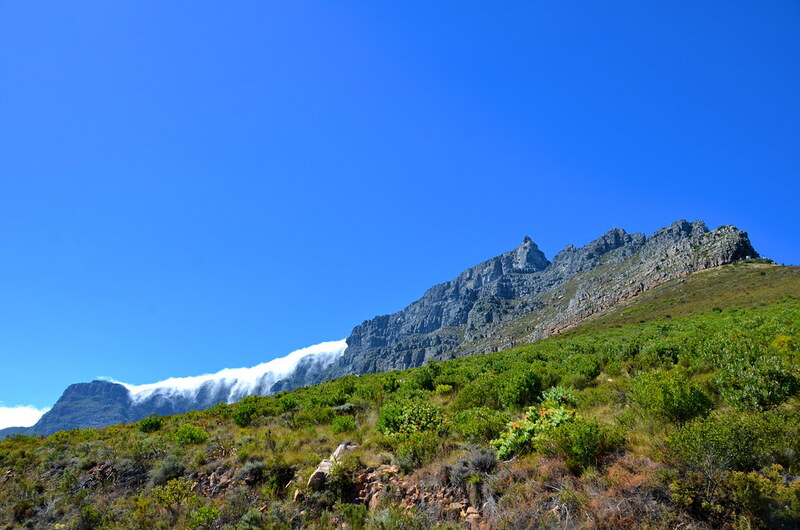 I love watching Table Mountain’s famous tablecloth roll over and cover the top. 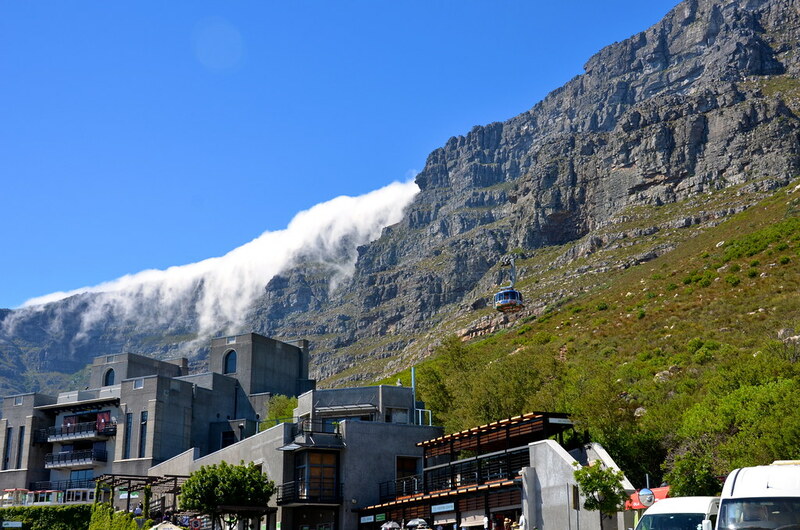 The tablecloth is part of an orographic cloud formation, which normally forms during the summer months when Cape Town’s south to southeasterly pushes moist air against the mountain’s slopes. 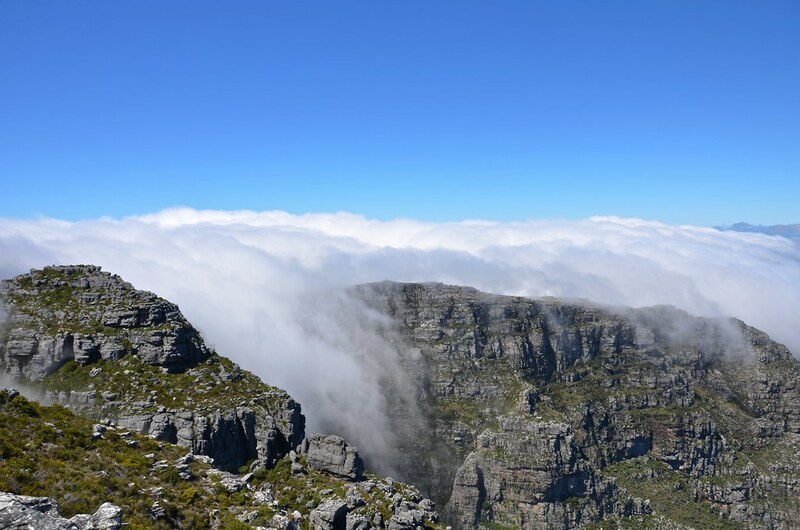 The air is forced to rise and, as it climbs it cools, causing the relative humidity to increase. 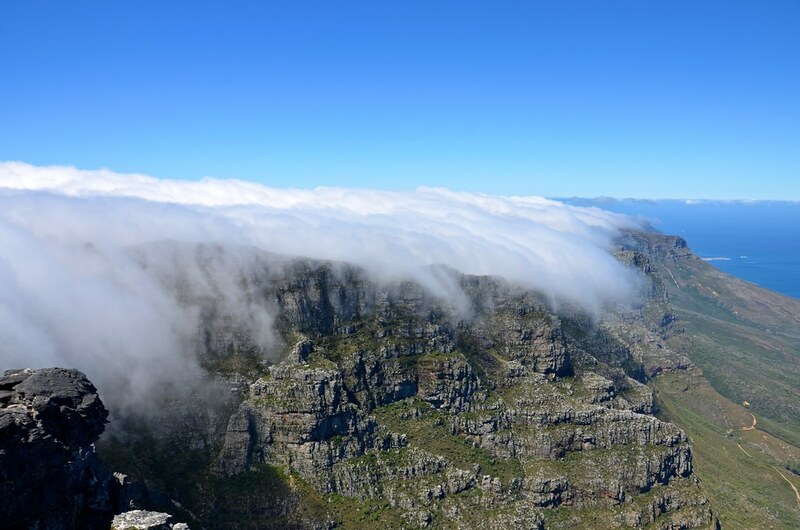 The moisture then condenses to form the world-famous tablecloth. 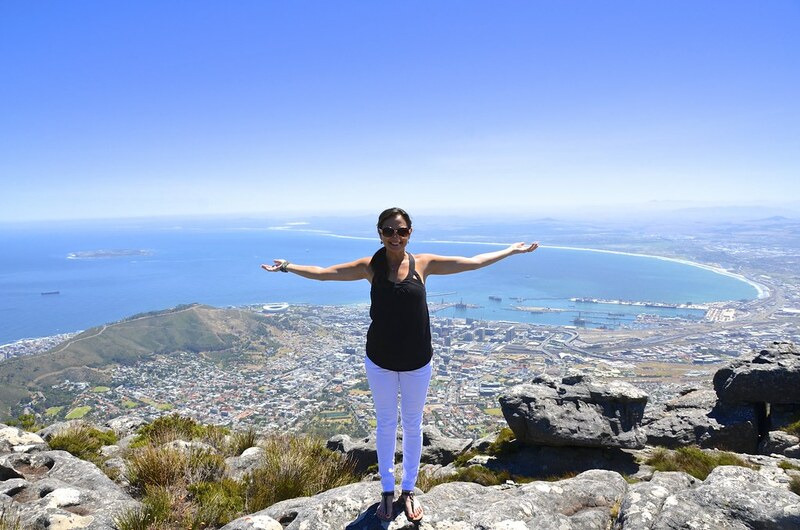 The weather at the top drastically changes depending on where you are standing. 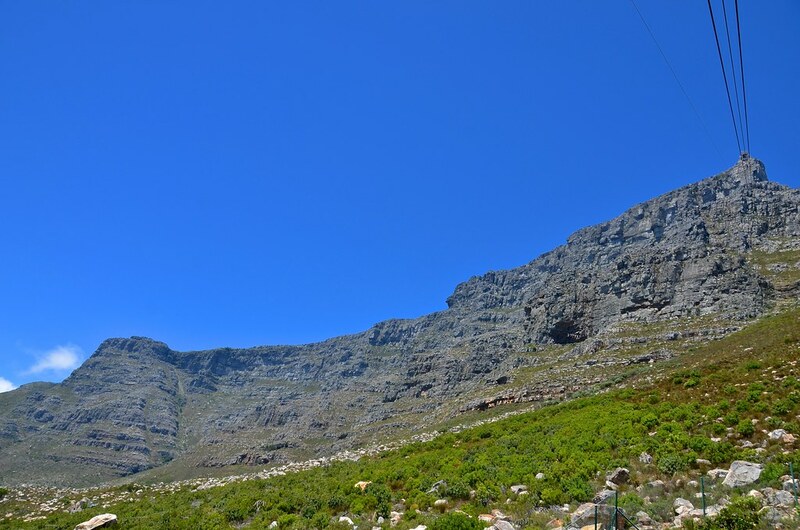 And it can get really cold inside the tablecloth. 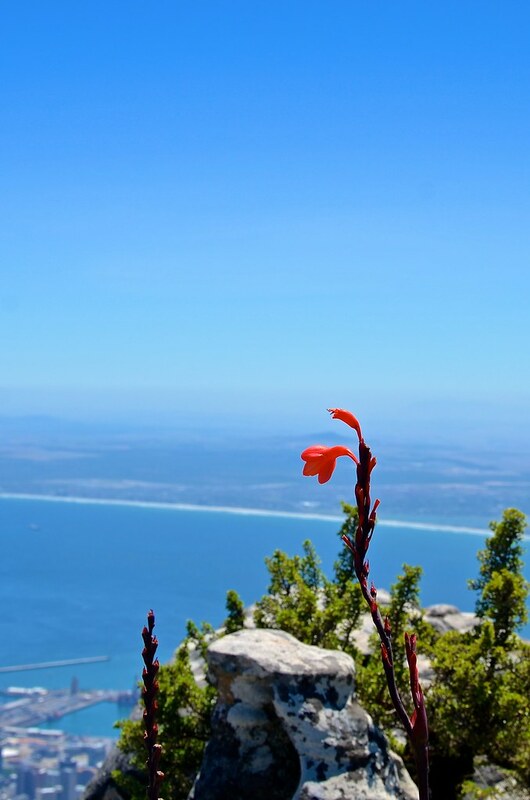 No matter where you stand, you’ll see beauty. 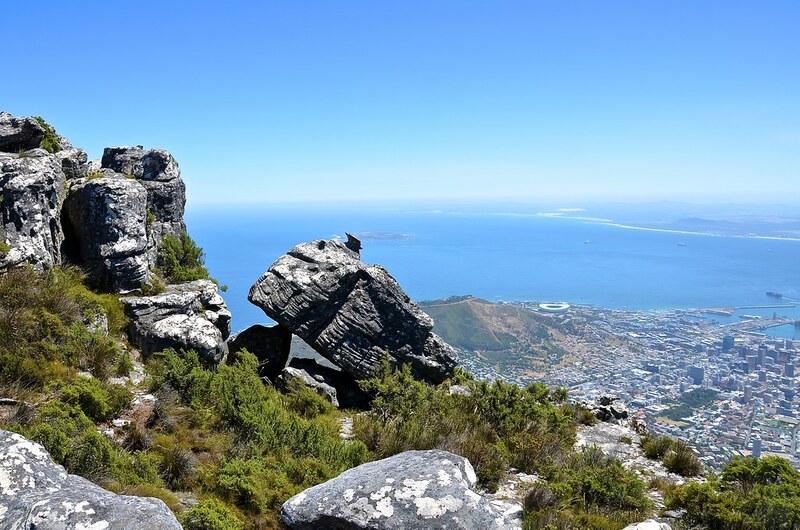 Plan on at least 2 hours when you visit Table Mountain. 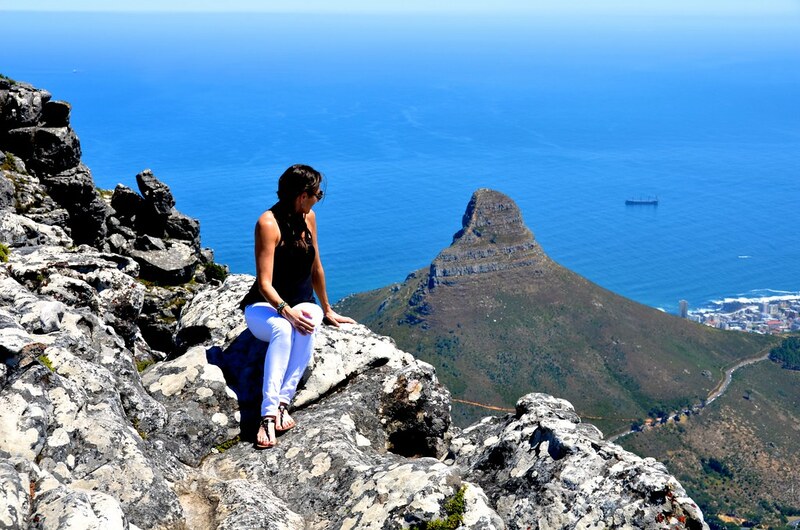 It’s a morning we’ll never forget! 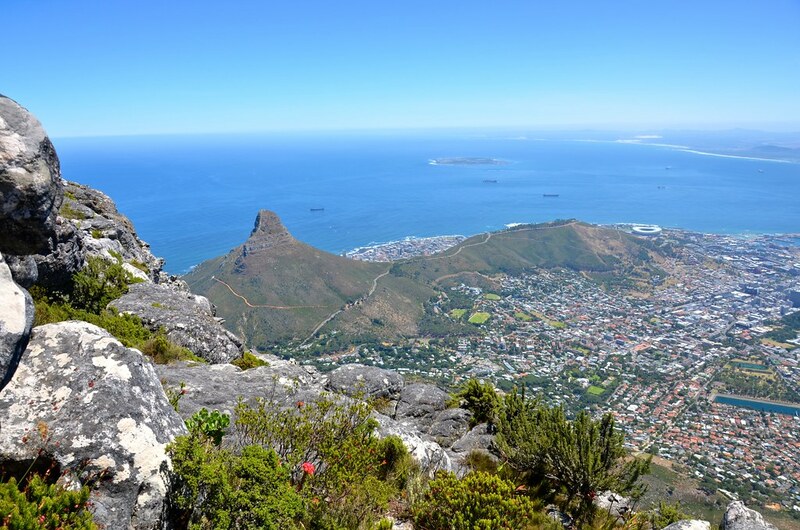 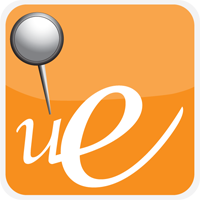 Click HERE for more on Cape Town and South Africa. 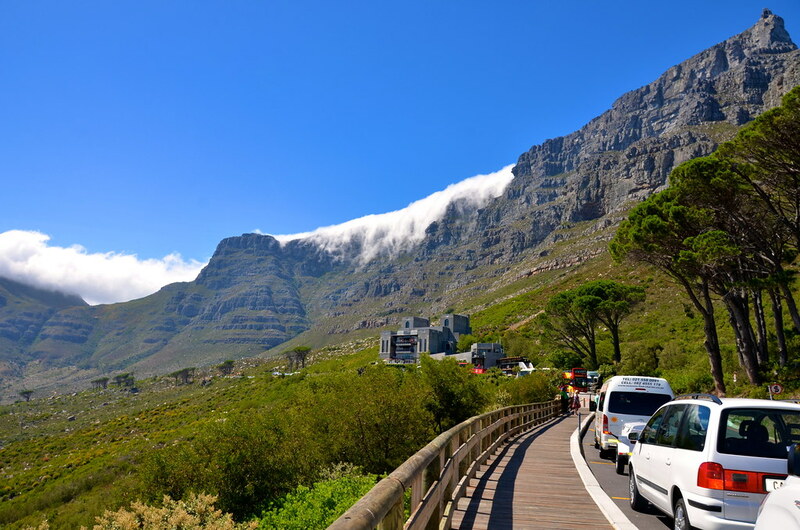 3 Responses to "Table Mountain, Cape Town"
Great pictures! 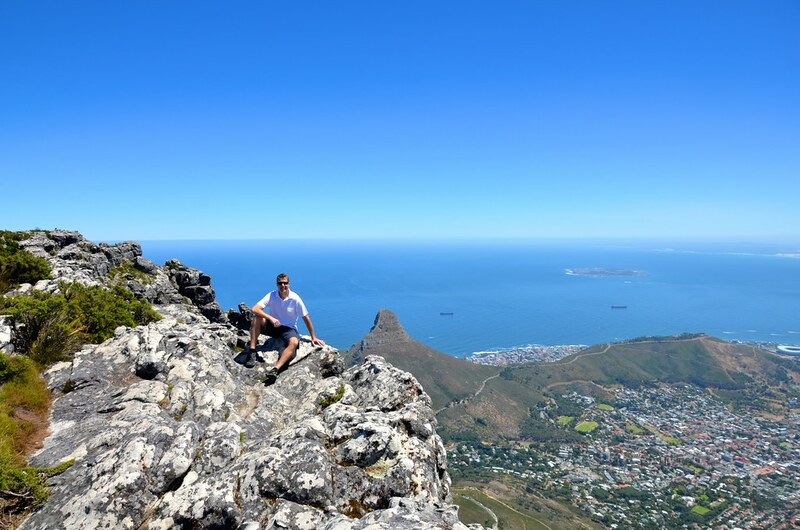 Table mountain sure is gorgeous – but I would contest that the view from the top of Lion’s Head is even more beautiful! 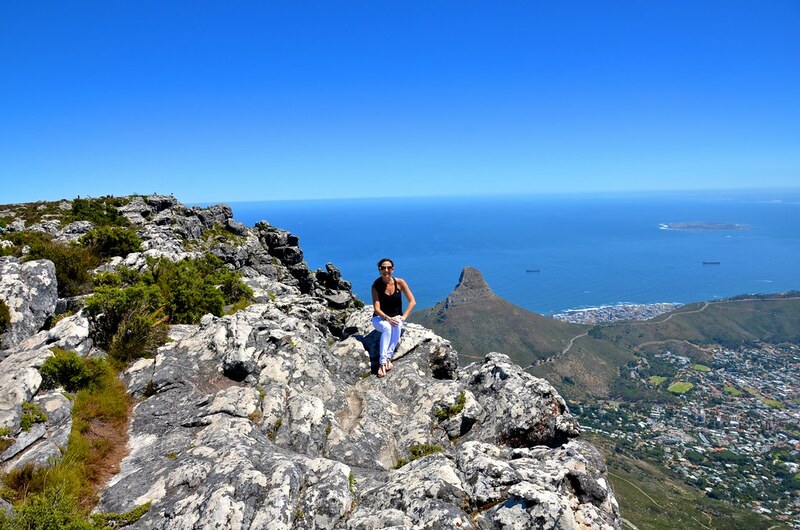 I hope you’ve gotten/get the chance to hike up there at sunrise. 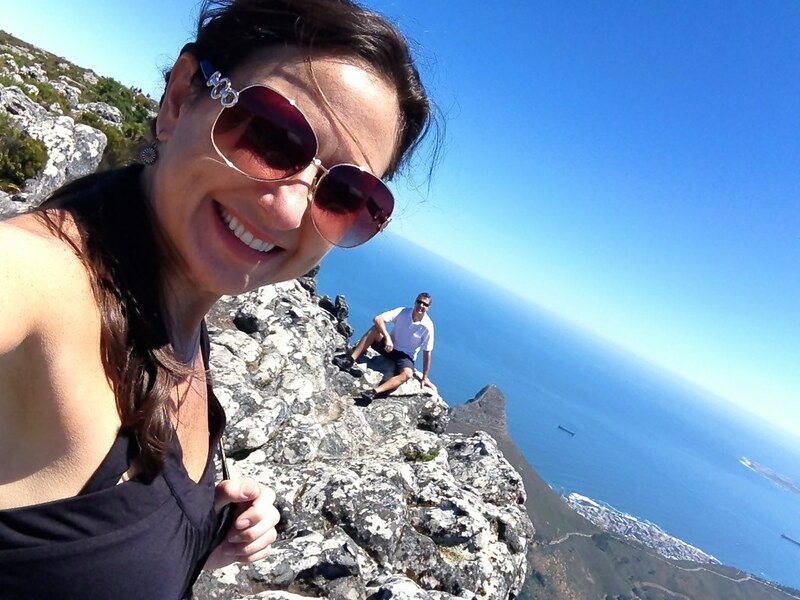 Great photos Kristi and John that looks like a great trip.